Then I stopped. And, because this was 2004, no one much noticed. This was before Facebook and Snapchat, before better living through Instagram filters, happiness as #humblebrag. It was before digital backups and the cloud, and because I was the kind of person who planned ahead for what I would rescue first from my apartment in a fire, I gave my photo albums—material and irreplaceable—pride of place by the door. This was 2004, the year my best friend died, and I stopped taking pictures of the world because it was a world she was no longer in. Susan Sontag reminds us in On Photography that all photos are memento mori, a means to an impossible end; the very attempt to fend off entropy is admission of defeat. I didn’t want a record of life going on after my best friend’s death. I wanted the world before to live forever and the world after to have the decency to cease. If recording the world made it more real, I thought, then maybe refusal to record could make it evanesce. Isn’t this, as they say, the way we live now? Pics, or it didn’t happen. My boycott didn’t work. I Rip Van Winkle’d my way through the dawn of the digital-camera age, through Flickr and Picasa and Twitpic and Instagram, only to wake up one day to my iPhone’s megapixel geotagging insta-share magic and give in. I took pictures. I took them without quite knowing why; I took them because I could. I didn’t print them, didn’t curate them, didn’t think of them again—certainly didn’t add them to the shelf of albums that had become my holy relics. I didn’t know what I was supposed to do with them, other than continuously, indiscriminately, compulsively, take them—and because I’d spent so long in willful oblivion, it took me a while to figure out no one else knew, either. There are still photo albums. There are expensive wedding albums, there are proud baby albums, there are at least 600 members of the Association of Personal Photo Organizers, who will, for a fee, “rescue, manage, organize, and save your photos—allowing you to easily find, preserve, and share your stories.” But these are the exceptions that prove the rule, the album as vestigial organ to which we feel some vague, infrequent responsibility. The album as matter of course, as default mode of personal narrative, the album as diary and mixtape, leatherbound song of self—that album has flatlined. Consider this my eulogy. In their analysis of a 2013 poll of 3,000 Britons, Samsung reported only 13 percent of eighteen- to twenty-four-year-olds had ever used a photo album. Two-thirds of all their photos were stored on electronic devices. One in five of those surveyed took their photos—1.9 billion photos per month in Britain alone—for the purpose of social-media sharing. A US poll from 2015, taken by the Professional Photographers of America, reflected a similar shift from material to digital: 67 percent of the 1,500 surveyed never bothered to print their pictures. Instagram reports more than 95 million photos uploaded per day—the app’s user base has grown to 600 million. More than 300 million photos are uploaded to Facebook per day, meaning there are more photos uploaded to Facebook per month than there are humans on the planet. An estimated 1.1 trillion digital photographs were taken in 2016. Were these to be developed as 4x6 prints and lined up end to end, they would stretch to the sun and back. covers, the kind included for free with the developed film. (The cardinal rule, Chez Wasserman: Never buy anything you can get for free.) These comprise—and, increasingly, constitute—my childhood. They do not, with occasional exception, contain images of my father, who invariably stayed behind the lens. Here I am lighting Hanukkah candles, blowing out birthday candles, licking a Mickey-shaped popsicle, careening down a water slide; here I am, only child in a middle-class suburban idyll, with my training wheels, my piano recitals, my T-ball games, my series of ever-more-humiliating haircuts; here I am, tugging at my mother’s arm or hanging over her shoulder, documentary evidence belying daddy’s-girl memories. In the childhood told by these photo albums, my father is nearly invisible. While he was still here, that was logistical necessity. Now, it’s salt in the wound: I flip through the pages, only looking for him, only finding myself. Myself and my mother, that is, and here’s something I resolutely don’t think about: How much some future version of myself will appreciate that I have so much of her left. There are certain albums I only allow myself to look at once a year, so that I can still pretend to be surprised by what’s inside of them. There is one that’s bright orange, fake leather, irredeemably ugly. My best friend and I peer out from a keyhole frame in the cover, our faces sweaty and pressed together, the alien red rocks of Arches National Park visible in the background only as a rusty smear. You’d have to know what you were looking at to know what you were seeing. This is the album of our last trip together; this is the story of 3,000 miles spent huddled in tents, tossing and turning on creaky motel mattresses, singing along to the radio, running from hailstorms, chasing roadside attractions, the barbed-wire museum, the mile-long candy counter, the fake ghost town and the real ones beyond. This is me, stretching my arms to catch the prairie wind; this is her, sticking her head through a stockade. This is the two of us, dangling our sneakers by their laces as we wade through canyon waters, hand in hand—always reliant, in this pre-selfie age, on the kindness of shutter-clicking strangers. This is the twin of an album that sat on her shelf, our prints pooled and carefully captioned with everything we vowed to remember. I took mine home to California; she kept hers in Brooklyn until she died, and then her mother took it away. She was my best friend for eight years; I have plenty of albums. But this is the only one of just the two of us, the only story where we’re the sole characters. This is the one I like best, and the one I allow myself to look at least. You’re wondering how they died. My best friend died suddenly, when she was twenty-six years old. When I tell people that with no further details—and on almost all things that matter, I default to no further details—they tend to assume the kind of death that strikes quickly and prefers youth. Drugs. Maybe suicide. Not cancer, which is what it was. Not leukemia, and not the kind that’s supposed to be curable. Which is what it was. You’re not supposed to go to the doctor on a Friday, thinking you have the flu, and be dead by Tuesday, before most of the people in your life know anything is wrong. My father died gradually, when he was sixty-one. Also cancer, which in this case followed the playbook, gnawed away at him for a year and a half until there was nothing left. Stomach cancer, which is probably, usually, not hereditary, although nobody seems to know, and which is usually, inevitably, not curable, as any doctor will tell you. The day he got the diagnosis, we knew he would die, and die soon. These are two of the people I loved most; these are the two people I loved with least complication. This, at least, is how I remember loving them. I say now: He was perfect, and I believe it. I say: She was the only best friend I will ever have. She would have stayed my best friend forever. These are the stories I prefer to tell. These are the stories I piece together from the photographic evidence, and so I know them to be true. 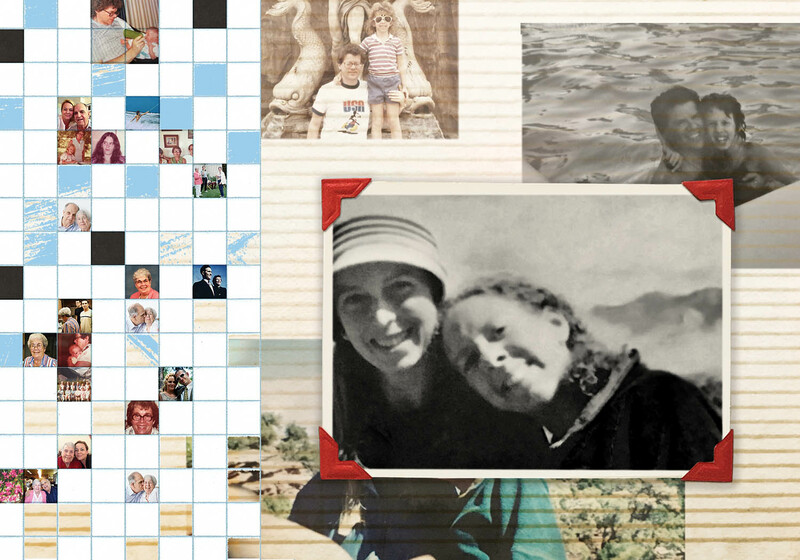 The photo album turns us all into historians of our own lives, arbiters of future memory: what to preserve, what to forget. The death of the author: What’s apparent, in the moment, as interpretation is transformed by the passage of time into documentation. And it seems to me forgivable, the temptation to read your life story with a Barthesian eye, to dismiss the intentional fallacy and accept the narrative on its own terms. To choose to believe. The Wassermans have a Dickensian relationship with Florida. As family vacations go, it was the best of times, along with the worst. Disney World, especially, evoked all manner of sulking and silent treatment—always my father’s and my preferred form of warfare. Every overfull parking lot, every toppled ice cream scoop, every sticky, sweaty, stinking mass of whiny toddlers and stroller-shoving tourists was a minefield. I remember this, but only in caricature, the way trauma fades to anecdote and eventually to inside joke; Florida, in my house, was code for a quixotic endeavor, the cheery pessimism of a journey with inevitable failure at its end. Florida kept betraying us, but we kept going back, tempted, maybe, by the pictures we brought home, all that surf and sunshine. All those smiles: We must have been happy. There aren’t enough photos of him, but there are more, in the vacation albums, than anywhere else. He was a voracious sightseer, with little patience for the anti-tourist’s world-weary disdain for “the beaten path.” The path, my father liked to say, is beaten for a reason. The path is how you get to the things worth seeing. He came; he saw; he photographed. But no wonder of the world was wondrous enough for my father to photograph without my mother or me posing awkwardly in front of it. This was his rule: no shots of pure scenery. What was the point, he argued (and there was often an argument, whether because it seemed pointless to spoil a beautiful vista with a retainered smile, or because I was too busy reading a book to pose, or because I was a surly teenager with bulky glasses and a Jew-fro hiding from the flash). The point wasn’t the scenery. It wasn’t the places we went, it was the fact that we went there, and went together. This was before the internet, before you could see any corner on Earth without changing out of your pajamas, back when, if you needed a picture of, say, the Eiffel Tower, you had to go to the library—or Paris. It seemed annoying then but prescient now, as if he’d glimpsed the future and knew we would eventually have an infinite photographic supply of everything but one another’s faces. So there I am sulking in line for the Haunted Mansion and summoning my nerve for Space Mountain; there is my mother doing water aerobics or gliding around on a carousel horse. And there is my father, having entrusted the camera to one of our shaky hands, riding the Teacups and taking in a It’s a Small World, posing before Epcot’s plaster models of foreign wonders, never expecting that someday he’d be able to afford a trip to the real thing. There is my father, grinning in one hot tub after another, because this was his favorite part of any vacation, and recording it became, in the way of family vacation traditions, mandatory. The week before his diagnosis—the week he was waiting for test results to come in and I was silently mapping out worst-case scenarios, because preparation seemed safer than hope—my parents took a cruise. They took a lot of cruises in those empty-nester days, which means that on the page, many of these vacations—the ones they took without me—tend to look vaguely alike. Portholes and deck chairs, pretty waves lapping at pretty shores. In the pictures from this one, they look like they’re having fun; in the obligatory hot-tub photo, he’s smiling. The historian William Everdell locates modernity in what he calls the “collapse of ontological continuity”: In nearly all fields of thought and culture, he argues, discontinuity is the founding principle of the modern age. As he lays out in The First Moderns, the years between 1870 and 1914 saw the birth of pointillism in art and infinitely parsable infinities in mathematics, Freudian fissures between conscious and unconscious mental states, atomic models of heat and neural networks and undesirable populations. This was the age of the gene and the quantum: the fundamental building blocks of life and the fabric of the universe, discrete, divisible, discontinuous. And—not coincidentally, for Everdell—this was the age of the photograph. The photo album served as counterweight for the camera’s atomizing effect, reconstituting severed slices of time into something approximating linear narrative. Photographs offered characters, plot points; the album shaped these into story. But if the album is a narrative, it’s a narrative of discontinuity, a defective flipbook whose figures dance herky-jerky across time and space. The digital age, with its millions of daily uploads—not to mention all the public and private surveillance photos and the presumable NSA archiving of our daily lives—seems to offer a corrective, the promise that, eventually, each instant will be pinned down on film. The promise is illusory; you can’t sum atomized slices back into a continuum, and even if you could, you’d still have lost infinitely more of the past than you preserved. It would just become easier to pretend otherwise. There aren’t enough photos of my father, but there are more photos than there are anything else. There’s no trove of letters or revealing e-mails, no secret journals, no scribbled thoughts or box of keepsakes. I know, because after he died, I ransacked the house. He took his secrets with him—and with him, almost everything was a secret. We live on the surface in my family, where it’s placid, where you can lie back and float without having to worry about what’s swimming beneath. We don’t volunteer answers without being asked, and we never ask. My father narrated his inner life only through photographs: He took the pictures, he made the albums, he decided what mattered. He was the author of the three of us. We were his one story. We don’t collect photos of sad things: not usually. Maybe as novelty, art, journalism, transgression—always exception, never rule. We don’t make photo albums of funerals or deathbed vigils or that post-breakup month we spent in bed marathoning NCIS. And so, as Paul Simon would have it, Kodachrome makes us think all the world’s a sunny day. My diaries, what few of them exist, almost exclusively document moments of despair. I can wallow in words; I can, and do, read up on old miseries, revisit the pain from a distance. Something about this feels both necessary and safe. Pain is different, in pictures. We don’t collect photos of sad things: not usually, not on purpose. But my father took seventeen months to waste away, and some of those were happy times, and there are pictures. There we are, smiling, hugging, holding on—and there he is, thinner, balder, the hollows of his face turning him skeletal, running out of days. These are the last pictures I have left of him, but I can’t stand to look. My best friend took less than a week to die, and also much longer than that. The disease was a stealthily occupying force, colonizing her without anyone realizing it. The last picture I have of her is from a birthday party two nights before she was diagnosed: This is a picture of her dying. I can’t stand to look at that, either. I also can’t stand to throw it away. All photographs of people are photographs of people who will one day die. Every picture is a picture of something that no longer exists. From this tension arises the poignancy of all old photos: Look at them, so happy. So young. Not just black-and-white pictures of strangers, stiffly posed women in their wedding dresses and stern men frowning from beneath stern hats, but our own weddings and birthday parties and baby faces coated in chocolate, the people in them long since vanished. The children are grown-up; the adults are senescent; the lovers are married, then pregnant, then disgruntled, then divorced. My albums are full of my dead best friend. Even before she died, they were already a memorial to a lost time, so maybe the difference now—the slightly sacred aura, the wonder that we were ever so happy, that she was ever so alive—is one of kind, rather than degree. Maybe my albums are all full of ghosts. Making a photo album took work, especially for the less dexterous and more impatient among us. A feat of concentration and mechanical labor: slipping a fingernail into the cheap plastic envelope, trying, failing not to split it open, sliding in a photo that never quite seemed to fit. Pressing pictures to sticky black pages. Inscribing painstaking captions. Inevitably running out of space or running out of memories. Material history ages. Pages yellow, prints fade, stickiness comes unstuck. The album embodied both the effort of its creation and the futility of its purpose and seems to me, in this age of frictionless digital storage, all the more loveable for its analog flaws. Technically, none of this is out of reach. The factory loom doesn’t foreclose hand-woven clothing; anyone with a still-functional Sony boombox and blank cassette tapes can make a mix. I could make another album, there’s nothing stopping me—and not a premade, glossy-paged book ordered online, but a messy, homemade, old-fashioned book of printed-out photos. People do it still, especially people with children. Maybe it’s only my own insecurities inventing a message that the world hasn’t actually sent me, that the domain of the printed photo is reserved now for the markers of adulthood, the life that’s finally gotten started, weddings and children and happy-family holiday cards; maybe the trivialities that comprise my arrested development, the picnics and ice cream cones and latte art, should take pride of place on my shelves, and my reluctance to let them stems from the same outmoded, retrograde, antifeminist assumptions that have me subconsciously waiting around for a husband before I buy an apartment—or a blender. Maybe it’s easier to pretend this is the story of modernity than to admit it’s the story of me. But even if I made my hypothetical album of breakfast plates and awkward Tinder dates, it wouldn’t be the same. You can turn off your electricity and declare yourself a citizen of the nineteenth century, but doing so won’t obliterate the fact of cars and indoor plumbing; the existence of digital photography and the internet and their misshapen social-media progeny—insert portentous tone here—changed things forever. Dusty box of negatives in the basement notwithstanding, photographs were once basically irreplaceable. You tore one up in a fit of rage, you lost one in a move, it was gone. Your possession of it—your control over who saw it and when—was absolute. It couldn’t be stored in a cloud or distributed to millions with a click of a button; it couldn’t be erased with the delete key or haunt you forever when you wanted it gone. It couldn’t be filtered or Photoshopped, reimagined into something new. It was a material object, to be safeguarded or destroyed. It was a record of reflected light, a physical piece of the past. It was, in the old-fashioned meaning of the word, a relic. Like everyone else, I document the way I live now—and now—and now. I’m writing this essay in a wooded Eden and have, more than once, looked up from the keyboard to snap a picture of the impressive-as-advertised foliage gleaming in sunlight or a particularly terrifying spider prowling the floorboards. I’ve taken these pictures without knowing why I want them—literally while writing an essay about not knowing why I want them. It’s a habit, even a compulsion, less a modern version of being here now than it is—in our multitasking postmodernity where mindfulness is just another thing on the to-do list that will never get done—a way of outsourcing the effort. Instead of pausing to experience a moment, how much easier to snap a picture, file the moment away for later. “The illiterate of the future, it has been said,” Walter Benjamin wrote—in 1931, with apparent help from his crystal ball—“will not be the man who cannot read the alphabet, but the one who cannot take a photograph.” Photography is not, as Benjamin had it, language—not yet, not quite. It feels like something more primal, our version of echolocation signals fired instinctively into the ether, a simultaneous declaration of existence and question for the universe: Is someone out there? Every “like,” every heart and thumbs-up, then, marks reflection off an object in the void, confirmation that we are not alone. I can be here now, but only if you know I am—if I know you’re somewhere out there, too. Since its invention, the camera has been our time machine. Now it’s also our telephone, our megaphone, our proof of life. I’d like to align myself with Mann, to think that my memories are brighter for escaping photographic imprisonment, that photography erodes memory and recording the world minute by minute paves the way for forgetting everything else—that I’m lucky to have suffered my greatest losses in the pre-digital age. I’d like to believe it, but I can’t. I can too easily imagine a dystopian future, maybe not so far away, maybe not so dystopian, where instead of cemetery graves, we visit electronic-media crypts—I can imagine stepping inside a booth walled with video installations of the dead, access granted to an archive of photos charting every minute of their day, every day of their lives, enough that there would always be something new, something fresh, something uncalcified by memory. I can imagine there might be enough to approximate a digital resurrection; I can imagine stepping inside a booth like that and never wanting to leave. Here’s the truth: I privilege curation over wholesale collection because I have to. Because the spotty record, the timeworn and ever-fading stockpile of over-familiar memories, is all I’ve got. I have to believe the age of the photo album had something precious to offer me, because I know what the age of Instagram has to offer everyone else, and it enrages me. It hurts: to imagine what it might be to have my father’s daily life captured on-screen, to hear my best friend’s voice again, even once, much less a thousand times on Google Voice recordings and iPhone videos and wherever else she might have made her digital mark, if she’d had her chance. It hurts to imagine having, instead of nine or ten photo albums, thousands of photos. Tens of thousands. The past is lost to us even as it’s happening; taking a picture is like grabbing a fistful of water. But my nostalgic impulses are almost outmatched by a bizarrely naïve faith in technology and its miracles. I want to eulogize the photo album most of all because I worry no one has noticed its death—once attention is paid, maybe we can get to work on a replacement. A new time machine, a new wormhole between past and future, a new way to shape our story for some later, lonelier version of ourselves. Here is what I know, even if I don’t want to: that I’ve only begun to lose things. That I will hurt again. Hurt more. Lose more. Keep going, again, eventually, always. But that knowing is something else I can outsource to the lens, and it’s a good thing, because if I had to live with it myself, I don’t know if I could. Let my iPhone remember, so that I can forget. I keep taking pictures. Abashedly and sporadically, with hope that someday I’ll know what to do with them, and they’ll do what I need them to do. Maybe, deep down, I still have some primal superstition of the image, the subconscious belief that I’m capturing something—not a shadow, not a lie, but a material sliver of the present. Maybe the photo is a futile blow against mortality, but I’m an optimist. I take the picture. I hope for the miracle. And, until it comes, I try to be satisfied by its lesser substitute. If I can’t hold onto the past and can’t resurrect it, I can, at least, haunt myself with its ghosts. Robin Wasserman is the author of the novel Girls on Fire (HarperCollins, 2016). Her work has appeared in the New York Times, Tin House, the Los Angeles Review of Books, and several short-story anthologies. She teaches in the MFA creative-writing program at Southern New Hampshire University. Thank you - a very moving and enjoyable essay. The subject matter resonates as I often think that we are erasing our own existence by reproducing multiple images of ourselves through digital images and also written communication. One of the things I am most grateful for is the fact that I have a record of my late father's handwritten notes and letters - whenever I read what he wrote and look at the few photographic images I have of him there is a real value as he comes alive all over again. I think that once we become fully digitised having records of emails and the memory chmber that Robin describes will not be quite the same. Beautiful piece. Photo albums are special.